The silver color of the remaining snags dot the landscape, looking north towards Three Fingered Jack Mountain in the Santiam Pass where scars are still visible from the area burned by the B&amp;B Complex 15 years ago. "We saw the big flames jumping from treetop to treetop," said then-President Bush, who visited the fire during his trip to Redmond. "It's hard to describe to our fellow citizens what it means to see a fire like we saw. It's the Holocaust; it's devastating." President George W. Bush called it a holocaust. Wildfire experts called it a canary in the coal mine. Those who saw it up close remember the speed and fury, and a smoke plume that rose 35,000 feet above Santiam Pass west of Sisters. Fifteen years ago this September, a wildfire known as the B&B Complex ripped across the forest between Mount Jefferson and Mount Washington. The 90,000-acre blaze shut down Highway 20, spurred evacuations, cost $38 million to fight and blanketed Central Oregon in smoke during a visit from the President of the United States. More than just a wildfire, the B&B Complex heralded the arrival of a new epoch in Oregon — one of bigger, hotter and more destructive wildfires. In combination with the 500,000-acre Biscuit Fire a year earlier, experts say the B&B Complex represented nature’s backlash to decades of wildfire suppression and overstocked forests. "It was a wake-up call," Oregon State University forestry professor John Bailey said, "that ‘ah-ha’ moment, showing us that past management policies and climate change would make these types of fires more common. In hindsight, the arrival of the B&B Complex shouldn’t have been a surprise, say experts. The first was a massive buildup of fuels — dead trees and material on the forest floor, especially in the Mount Jefferson Wilderness. Historically, small wildfires frequently swept across the Cascade Mountains, clearing forests of underbrush. That cycle was halted through a policy of putting out virtually every wildfire. By August 2003, the fuels were historically dry. 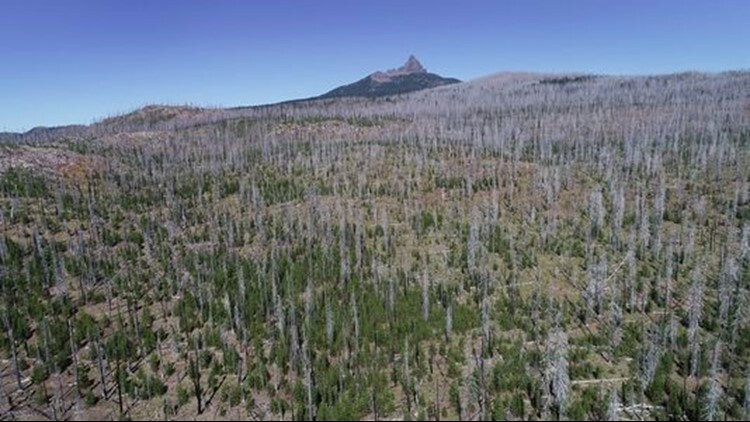 Federal officials warned that moisture levels in Oregon forests were at their lowest levels in decades. All it needed was a spark. That arrived in early August when a series of thunderstorms raked the forest with lightning, sparking multiple small wildfires. Most were put out. But on August 19, two wildfires emerged and grew at a breathtaking pace. 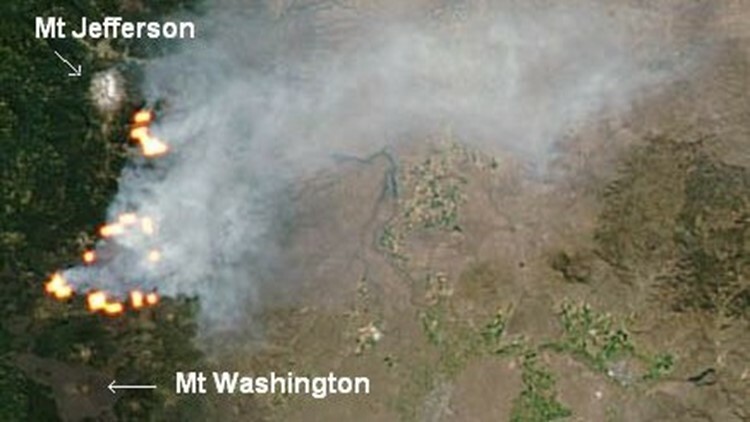 Views of the B&amp;B Complex wildfires on Aug. 21, 2003. The Bear Butte Fire was reported on the north side of the Mount Jefferson Wilderness. Just hours later, the Booth Fire ignited near Henkel Butte, eight miles northeast of Camp Sherman. To start, they were about 15 miles from each other. Fueled by winds of 35 mph and temperatures near 90 degrees, both fires roared to life, quickly growing to more than 1,000 acres. The flames of the Booth Fire reached Highway 20, forcing the closure of the main thoroughfare between Salem and Bend. Despite aircraft dumping water and retardant, both fires expanded, growing to 3,000 acres apiece and forcing the evacuation of 1,000 people from Camp Sherman, Hoodoo Ski Area and numerous campgrounds and resorts. By Aug. 22, management of the two fires combined into one team fighting what was dubbed the B&B Complex. The two fires had already torched a total of 24,000 acres. “We knew it was going to get big because of conditions in the wilderness area,” said Doug Johnson, a fire manager on the B&B Complex who’s fought fire in Central Oregon for 32 years. “We decided to fight it as it came down out of the wilderness and into land where there had been more management activity and where there were roads we could use to slow it down,” Johnson said. At 36,000 acres, cool temperatures and moisture slowed the fire, allowing residents in Camp Sheman to briefly return home. Hot temperatures and high winds gave new life to the fires on Sept. 1 and 2, sending the blaze into its most explosive moment of growth. 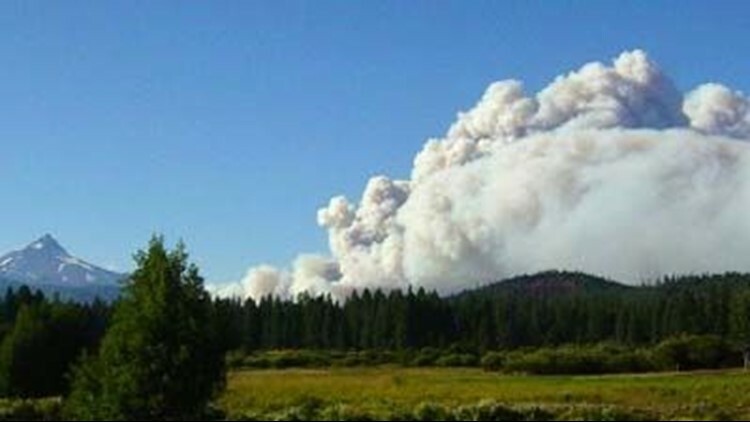 The fire raced from Central Oregon across the Cascade Crest and into the west side forests, eventually bringing evacuations to Marion Forks east of Detroit. “The B&B was unique because of the unusual flow of wind that was hitting it,” Bailey said. “It had a huge run to the west, then a frontal system came through and pushed it 180 degrees the other way. 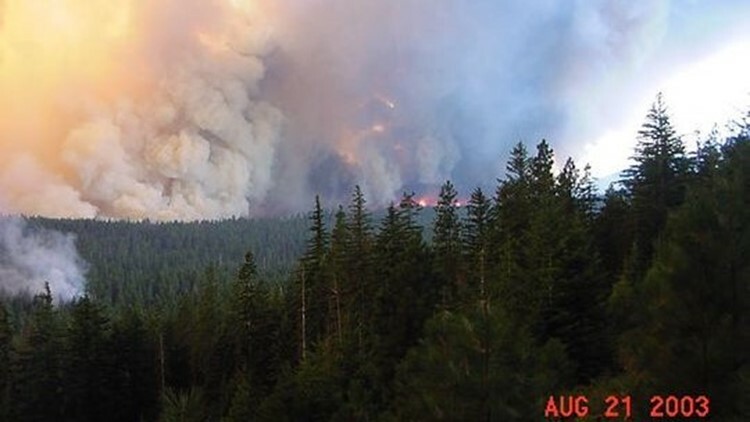 On September 4, the two fires merged, creating a plume “that arched 35,000 feet into the sky and could be seen from as far away as Portland,” according to a story in the Bend Bulletin. 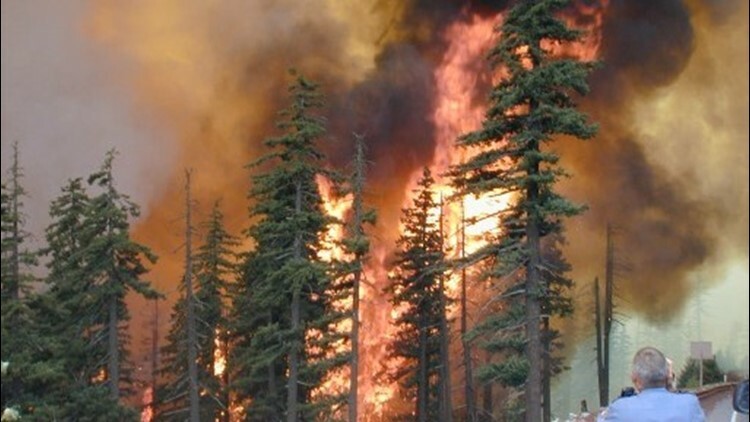 In just 24 hours, another 20,000 acres of forestland exploded in flames, the newspaper said. Peterson said he remembered the moment, particularly how that massive plume created its own weather pattern. In the phenomenon, the fire's intense heat lofts smoke into the air, generating powerful winds, moisture and huge pyrocumulus clouds. “These anvil-shaped thunderheads perch atop smoke columns and spawn extreme turbulence, down drafting winds, and even hail that, rather than cooling flames, stokes them by churning out even more erratic winds,” said a story in Popular Science about the phenomenon. Peterson said he couldn’t believe the size of the column. The fire ate up square miles in the wilderness backcountry, but the containment lines and protection from the army of 2,400 firefighters largely held. Damage to civilization was limited. The end came thanks to a firehose of rain that arrived like a blessing from the sky. Between September 7 and 8, more than 2 inches of rain fell on the area where the fire was burning. Without the deluge, the fire would have grown far larger than 90,000 acres, Johnson said. The B&B Complex brought a change to how Oregon viewed wildfires. “When I started my career, we thought of a 2,000-acre fire as being big,” Johnson said. “Then along comes these fires like Biscuit and B&B that we just hadn’t seen before. "At the time, we thought it was an anomaly, but we've since come to realize that it's more of the norm." In the wake of B&B, Peterson said, fire managers realized the legacy of wildfire suppression and the potential danger it could bring. “This was one of the first examples when people looked at this and said, ‘Wow, this is the situation we set ourselves up for,” he said. Since the fire, officials have been made investments in more prescribed burning to reduce fuel loads, and are “more thoughtful about where and how we use suppression," Peterson said. Willamette National Forest pushed forward two years ago with a project to do prescribed burning in the Mount Washington Wilderness — a first for wilderness areas in Oregon’s Cascade Range. Another positive example of post-B&B activity came during the 2017 Milli Fire. The Central Oregon fire was burning toward Sisters until it reached an area where thinning and prescribed burns had eliminated much of the fuel. The slowdown may have saved Sisters from being burned, officials said. At the same time, both Johnson and Bailey said Oregon hasn’t done anywhere close to enough overall to prevent major fires. Legislation that would allow the large-scale prescribed burning and thinning have been talked about, but are slow in materializing. Just as fire managers prophesied, Biscuit and B&B did mark a change in the amount of fire the state sees. In the decade before the two megafires — 1992 to 2001 — Oregon burned an average of 198,000 acres, according to the Northwest Interagency Coordination Center. In the years between 2002 and 2017, that number jumped to an average of 433,541 acres burned each year. 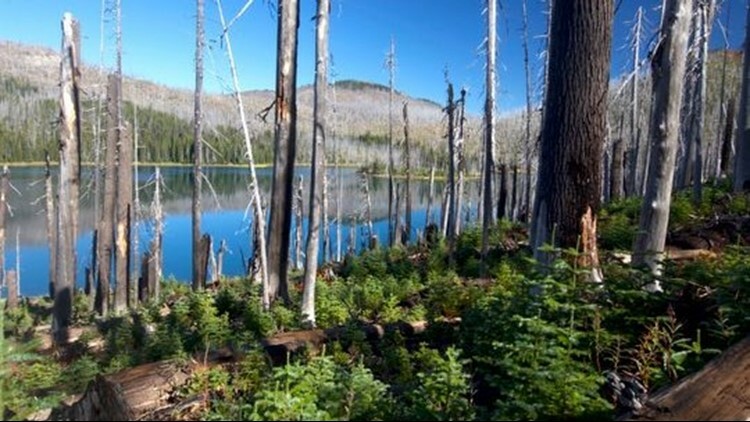 Mowich Lake in the Mount Jefferson Wilderness shows both trees burned by the B&amp;B Complex and the small forest along the forest floor. “We’re still playing catch up,” Johnson said. “We have thousands upon thousands of acres that we need to treat to get anywhere close to normal conditions." Both said an important first step would be legislation allowing more fire through prescribed burns than is currently allowed. Fifteen years later, anyone who travels across Santiam Pass on Highway 20 will see evidence of the B&B. The wildfire torched much of the forest to its bones and left a graveyard of dead trees in its wake. But, ever so slowly, the forest is rebounding. In the Eight Lakes Basin — which exploded in flame during that 20,000-acre spasm — a miniature forest of knee-high saplings has created a green carpet below the dead snags. Douglas fir, hemlock and lodgepole pine are all regenerating. Even in areas that burned down to the soil, the forest floor is carpeted with fireweed and huckleberry, beargrass and a tiny wildflower commonly called pearly everlasting. Zach Urness is the Statesman Journal’s outdoors reporter. Zach has been an outdoors writer, photographer and videographer in Oregon for 10 years. He also has a podcast Explore Oregon. He is the author of the book “Best Hikes with Kids: Oregon” and “Hiking Southern Oregon.” You can reach Zach at zurness@StatesmanJournal.com or (503) 399-6801. Find him on Twitter at @ZachsORoutdoors.